What’s in a name? This is a question I never thought I would ponder. I always thought it was neat to know the meaning of a name. You know, for example, knowing my own name meaning “butterfly”. It’s fun for me because butterflies are so graceful to watch. And, being a ballet dancer, it suits me. But beyond that, I never thought much into name meanings as far as picking names out for my future kids. Just looking at names based solely on what I thought sounded cute. June of 2013, on a Saturday, I took a home pregnancy test that was positive! I was so excited I wanted to scream. I couldn’t wait to tell Brett. This was almost exactly a year after we had started trying to start our family so we were beyond ready to start this journey of being parents. During this time, I was living with my parents while Brett was in AIT. On the weekends he got to stay with us, but had to be in the barracks during the week. (So, how we got pregnant in the first place with so little time together is beyond me. Definitely a blessing from God.) This particular weekend, he had some kind of training scheduled on that Saturday so I wasn’t going to be able to see him until church on Sunday. Getting to tell him such exciting news was something I had dreamed about from the beginning. We were both on cloud 9! Well, the next day, Monday, I went in to have my official test done at the doctor’s office and then made a follow up for that Wednesday to get the test results and set up a referral to the OB. The wait between Monday and Wednesday seemed like months instead of days. I was just beside myself with anxiousness waiting to know what the results were! Wednesday came around. A day that is etched in my memory like it was yesterday. I woke up in what seemed like a nightmare. My alarm went off and I went to restroom. I had started spotting. I was trying not to get to nervous about it. I mean a lot of women have some spotting during pregnancy and nothing comes of it. But, I was thankful that I had a doctor’s appointment to just ask about it. Pretty much hoping that my PCM would just reassure me that it was no big deal and move on. I had got to my appointment and in the triage, the nurse figured out I was probably about 6 weeks according to my cycle. So that was exciting. But then she asked if had an noticeable bleeding since I made the appointment. And I told her that I was spotting when I woke up that morning. Without saying anything, she got up and left the room. Then my PCM came in and told me I needed to go straight to the ER. I went to go get my mom on the way to the ER to have some support. By this point, I hadn’t told her yet because Brett and I wanted to tell them together and do a surprise reveal kind of thing. I am so thankful for her being there. I don’t think that I could have made it through the time in the ER by myself. That was not exactly how I was expecting to start this, what was supposed to be a happy and exciting day. To make a long short, I had miscarried the baby. I found out on a Saturday the exciting news and by Wednesday, the baby was gone. Going home from the ER that afternoon/evening, I was not looking forward to the phone call to tell Brett. My heart ached. Before I called him, I called my lovely paster’s wife from our home church in Arkansas and was talking to her about it. The one thing in the conversation that stuck out the most was her asking me if I had named the baby. This kind of threw me off because I hadn’t really thought about it. I didn’t even know if it was a boy or a girl. How was I supposed to name a baby that I had never actually gotten to see. Not even of an ultra sound. She told me, every life deserves a name. So I brought it up to Brett during our phone call. He, at first, didn’t like the idea of naming the baby. Like it hurt to much to think about it and put a name to a child he would never meet. However, throughout the conversation, I finally got him to agree and he just said the first name that came to his mind, “Jonathan”. I agreed, for the main reason that at least he was willing to name the baby. Not really for any other reason. We left it at that. 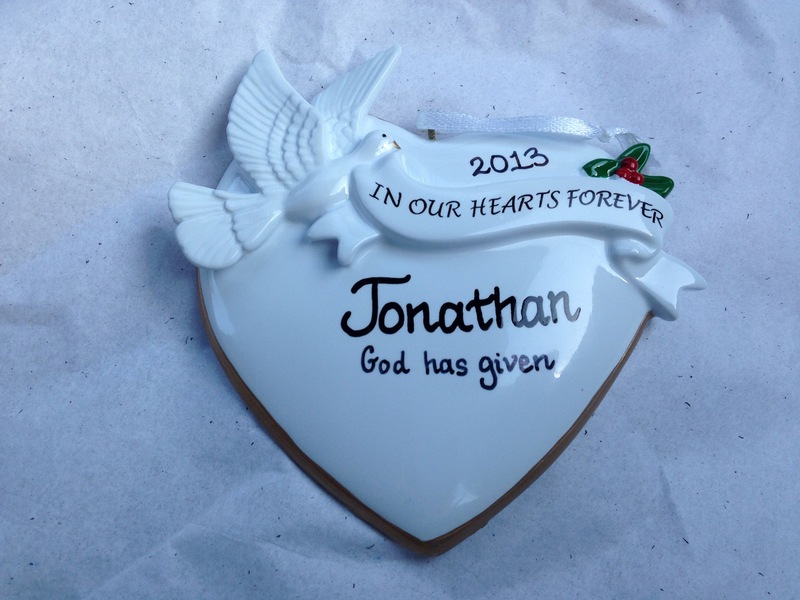 The above picture is an ornament we got and had Jonathan’s name put on it with the meaning so we always have something that will remind of us of this gift that God gave us. So beautiful…your hearts, your love, Gods love and a name…given with a heart in grief. God truly does work all things together. What a beautiful work he is putting together in your lives. Thank you for touching mine with your “heart notes.” Hugs to you both!